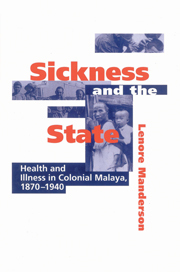 This 1996 book is a history of health and disease in colonial Malaya from colonisation to the outbreak of World War II. This was a period marked by dramatic economic expansion, rapid population growth and changes in patterns of infection. Drawing on the contrasting environments created by colonial capitalism, the book emphasises the role of medicine in legitimating colonial presence and shows that the ill-health of individual populations was directly related to their social and political climate. Viewing colonial Malaya through a series of complex lenses, the book integrates social and material history, historical epidemiology and demography, as well as theories of political economy, feminism and postcolonialism. In doing so, it offers a compelling account of the history of disease and changing health status under colonialism. 8. Conclusion: the moral logic of colonial medicine.